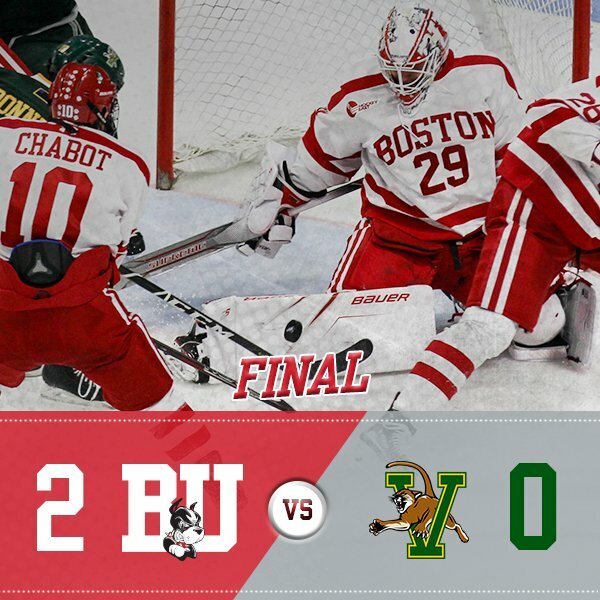 Behind goals from Drew Melanson and David Farrance and a 33-save effort by Jake Oettinger, BU blanked Vermont, 2-0, at Agganis Arena to nail down the fourth seed in the Hockey East Playoffs. For Oettinger, it was his fourth shutout of the season, having previously blanked Providence, Maine and Arizona State. The game also marked a milestone for Head Coach David Quinn, who notched his 100th win, joining Harry Cleverly, Jack Kelley and Jack Parker as BU coaches who reached the century mark. After a bye week, BU will host a quarterfinal, best-of-three series against either Maine or Connecticut beginning March 9. (Playoff format). BU and Vermont conclude the regular season tonight at 7 p.m. with Senior Night Ceremonies preceding the contest. The game will be live-streamed on Terrier TV. Jordan Greenway, who suited up a day after returning from the PyeongChang Olympic Games, set up a power play goal early in the first period, centering a pass in the slot to Melanson, who fought off a Catamount defender, to beat Stefanos Lekkas. Hank Crone also assisted and has seven points in his last eight games. BU extended the lead early in the second. Gabriel Chabot disrupted a Vermont rush in the neutral zone with the puck deflecting to Farrance racing into the offensive zone. From the left faceoff circle, he wired a shot short side over Lekkas’s shoulder. After outshooting the Catamounts over two periods, 27-21, BU was on the short end of shots in the third, 12-8, but did a good job of getting the puck deep in the Vermont zone and minimizing grade A scoring chances. BU also dominated the faceoff circle with Bobo Carpenter and Shane Bowers combining to win 14 of 19 draws. 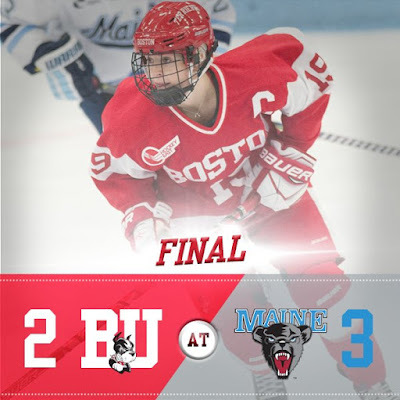 Greenway’s return also paid dividends on the penalty kill where BU had struggled in his absence. Last night, the Terriers were a perfect four-for-four on the PK. 2018 recruit Jake Wise’s first-period power play goal was the game-winner in the NTDP U18s’ 4-1 win against Central Illinois. Wise and fellow recruit Jack DeBoer had also assisted on Team USA’s first goal. Tyler Weiss also picked up a helper. 2020 recruit Dylan Peterson drops the puck to fellow recruit Donovan Sebrango, then heads to the net for a return pass and converted the game-winner in overtime as CIHA Midget White edged Navan U18 AAA4, 5-4. It was Peterson’s second goal and defenseman Sebrango’s third assist. In the Voyageurs previous game, a 6-3 win against Cornwall U18, Peterson had a four-point game with two goals and two assists. He leads CIHA in scoring with an 11-19-30 line in 26 games, while Sebrango has five goals and 16 assists. 2021 recruit Jeremy Wilmer now has 73 points (34G, 39A) for the Long Island Gulls 14U Bantam Majors, equaling his total of last season with the 14U Bantam Minors. Terriers’ dropped a 3-2 decision to Maine in the opener of a best-of-three quarterfinal series at Alfond Arena. The Black Bears took an early 1-0 lead and then scored twice more within a minute for a 3-0 lead. Nina Rodgers got BU on the board late in the first assisted by captain Rebecca Leslie and Victoria Bach. Midway through the second period, Bach narrowed the margin to one with a power play goal, assisted by Leslie and Jesse Compher. BU outshot Maine 16-6 in the third period—including a breakaway opportunity for Bach— but couldn’t produce an equalizer. The teams play again today at 2 p.m. with BU looking to stave off elimination. Leslie’s two assists gave her a program record 101 career assists, surpassing Marie-Philip Poulin’s 100. She has 32 helpers this season and 53 points overall.